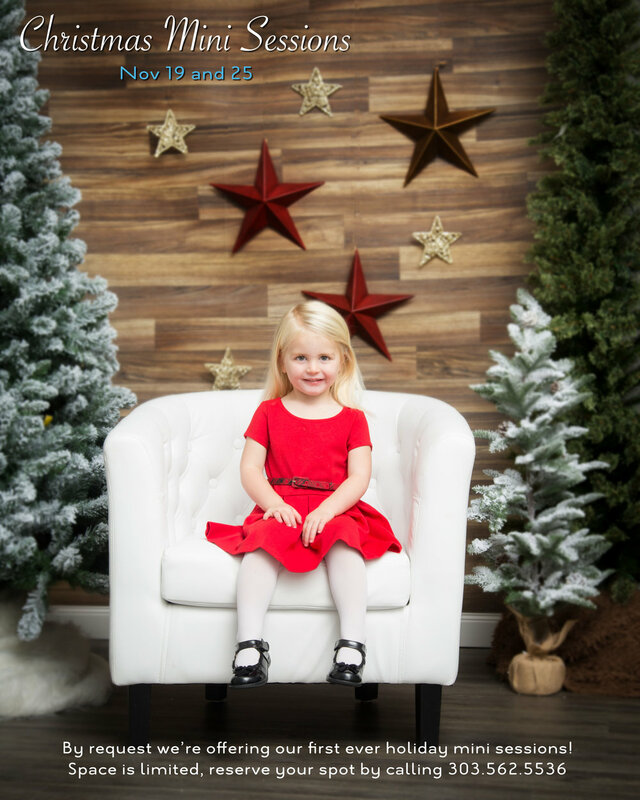 Holiday Mini Sessions - Reserve your spot! Join us for holiday mini sessions in studio November 19th or 25th. There is no cost to participate (a credit card is required to reserve your session). Sessions are limited to children ages 1-18 and/or well behaved dogs. This is a great way to get holiday-inspired pictures for your Christmas cards or gifts for family members. Because of the proximity to Christmas we will only be offering digital files. Options begin at $150 and spots are limited. Book your mini session before November 12th and you'll also receive an additional 20% off holiday cards. Call (303) 562-5536 for more information or to reserve your spot!